The BMP085 is a barometric and temperature sensor. I’ve got one on a breakout board from geeetech. Using this and an arduino, it is possible to build an electronic barometer. The sketch is originally written by Jim Lindblom at SparkFun Electronics, I updated it slightly to be able to use a more up to date wire library. BMP085. This will report the temperature and barometric pressure (in Pascal) on the serial port. It is also possible to combine this with a DHT11 (or DHT21 / DHT22) sensor to also get a humidity reading. See https://github.com/sickel/DHT_BMP085. The DHT has to be connected to +5 and gnd, signal to port D2 on the arduino. 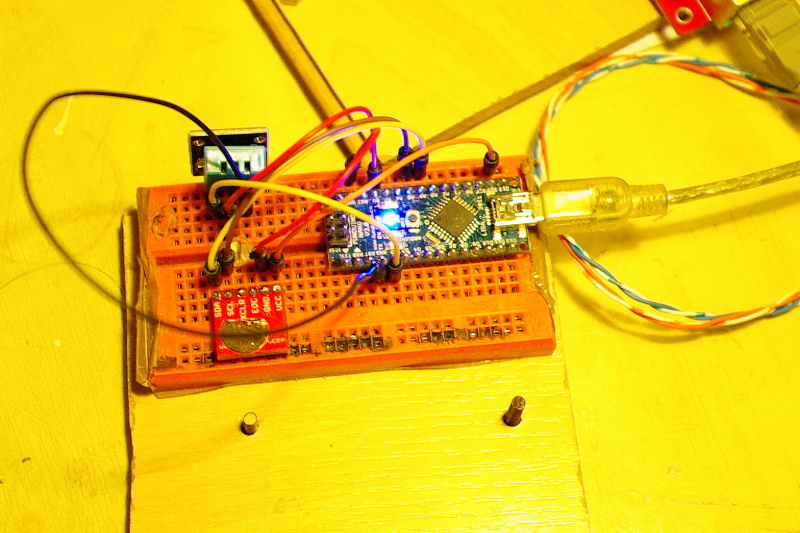 The DHT library can be downloaded from arduino.cc. Arduino nano, DHT11 temperature and humidity sensor (blue – at top),BMP085 temperature and pressure sensor (red – at bottom). This work has been done in Arduino 1.0.1 on a debian system.